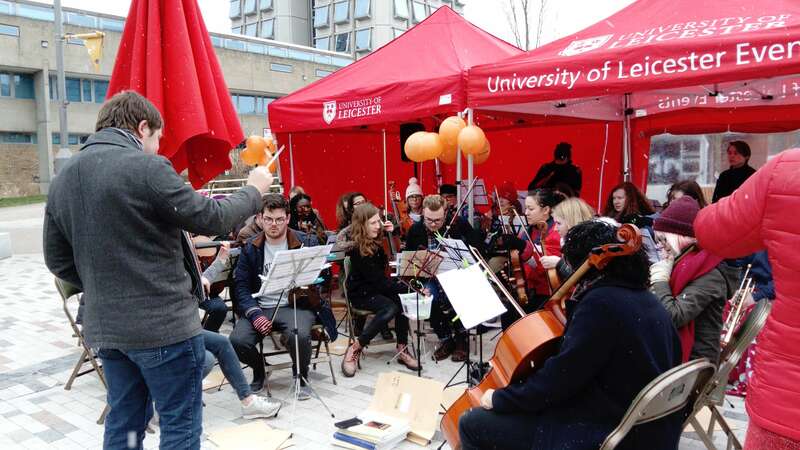 UoL Orchestra performs in the snow. Every February, universities across the UK participate in ‘Raising and Giving’ (RAG) Week, and here at Leicester we’ve been giving it all we’ve got. This year it also coincides with ‘Wellbeing Week’, making the campus a pretty positive place to be. Despite not being very musical myself (I attempted to learn piano when I was thirteen, and was asked politely to stop), my housemates most definitely are. In fact, they’ve been busy planning the most daring charity events this week – a twelve-hour marathon performance for Music Against Myeloma. So, at eight-thirty am on Monday morning, I found myself dutifully sat outside the Student’s Union listening to UoL’s Chorus Society singing Orinoco Flow by Enya. Although not my typical start to the day, it did get my morning off to a great start. After spending the next few hours plugging away at my dissertation in the library (I’ll definitely tell you much more about dissertations in the near future), I popped back out to supply the chilly musicians with coffee and applaud the rather damp orchestra. 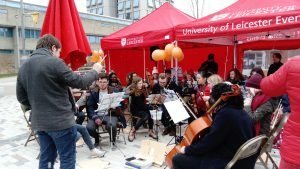 With their links to the Philharmonia Orchestra (based just down the road at De Montfort Hall), it’s safe to say that the UoL Orchestra is one of the best student orchestras in the country. Who would pass up a chance to see them performing for free? After lunch (and even more inclement weather) the event was moved into the SU to protect the instruments and technical equipment. This ended up being a great idea, as the open space in the SU Square complemented the Big Band’s bold and brassy sound perfectly. By the time the twelve hours was up, the event had managed to raise a whopping £384.45 for Myeloma UK, the only charity in the UK dealing exclusively with myeloma, a rare bone marrow cancer. But the great work doesn’t stop there! The SU and student societies have got loads more stuff planned throughout the week, including an all-day cricket marathon, Clown School, a 24-hour Sponsored Run hosted by the Leicester Running Club, and a clothing donation station in Queens Hall. Hiya! I'm Tabby, and I'm a third year student studying Natural Sciences. Alongside blogging, my hobbies include podcasting, baking (and eating) cake, and going on long walks in hilly places. Follow my blog to join me on my quest to find the best coffee shop in Leicester! You never know, you might learn something cool along the way.